Which Amenities Will You Choose With the Ford Escape? | Fred Martin Ford Inc. Which Amenities Will You Choose With the Ford Escape? With the Ford Escape, you can choose between a wide range of amenities. Our team at Fred Martin Ford Inc. shares a common goal to keep our consumers informed about what our models have to offer, so we welcome you to read about a few amenities that come with the Ford Escape. 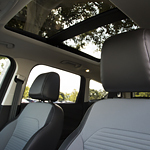 With the Escape, you can choose the available Panoramic Vista Roof. This roof features a forward panel that can tilt up or open completely, and there is also a fixed rear skylight for passengers in the back seats. This panoramic sunroof provides drivers and passengers with fresh air and natural light. The Escape also comes equipped with SiriusXM Satellite Radio and Navigation with the SiriusXM Traffic with Travel Link. You can enjoy more than 150 channels of live sports, music, entertainment, and more. The SiriusXM Traffic with Travel Link provides you with voice-guided directions through the Global Positioning System (GPS) and 3D mapping.